Weather for two lately abi? Well, I'd say weather for goat meat pepper soup to avoid stories that touch :D . I love goat meat especially when I can taste the stubbornness of the goat-don't ask me how. Just know that stubborn goat has a taste. I already have a detailed version of how to mix your own pepper soup spice in this CATFISH PEPPERSOUP post/video but this version below is the easy, no stress, way to making pepper soup. With the right pepper soup mix, you are good to go! ​Cut goat meat into byte sizes, wash and place in a pot with water, season with salt, onions and seasoning cube. Allow to boil till goat meat is softened, this can be anywhere from 35 minutes to an hour. 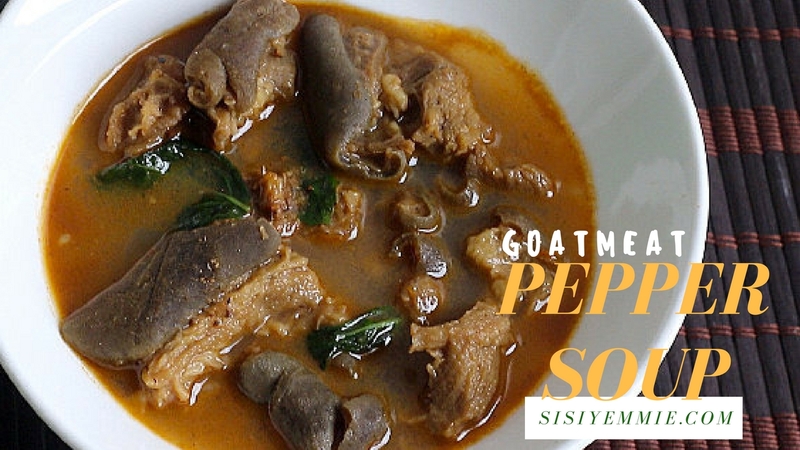 Now make sure there is enough water to cover the goat meat because it is pepper "soup" after all, Add your pre-made pepper soup spice , add pepper, I like to use different types, dry ground yellow pepper, cayenne, a bit of paprika. I like it hot! Cover the pot and allow to cook-the pepper soup should be ready in 15 minutes. I'm a big fan of goat meat as well, there's just something about the taste. This looks yum! I never put paprika in mine before but will try that today being sunday.